The chaotic introduction of new border controls is causing long delays at airports popular with British travellers. Airline association Airlines for Europe (A4E) has issued a warning that flights are being missed and delayed as a result. Some key hubs for holidaymakers, such as Paris, Lisbon, Mallorca, Madrid, Milan and Brussels are grinding to a standstill. Understaffed airports are struggling to process the new entry and exit checks brought in after the Paris and Brussels terror attacks. Unfortunately for travellers, airlines will not be at fault for delayed flights, so you will be ineligible for financial compensation under European Commission regulation EC261. Unfortunately, passengers cannot claim for compensation if they miss their flight due to delays at security checks. We advise passengers to make sure they arrive at the affected airports well in advance of their flight and monitor the airports social media channels for live updates to avoid any issues. Pictures of queues hundreds of metres long lasting up to four hours have appeared on social media. The extra wait time per passenger is because border staff must now check passengers against security databases such as the Schengen Information System and Interpol’s log of lost and stolen travel documents. Our advice to travellers is to factor this into your travel schedule, or risk a travel disruption or missed connection for which you won’t be able to claim financial compensation. For the very latest news tune into your airport’s social media account, as well as checking for any emails or text updates from your airline. 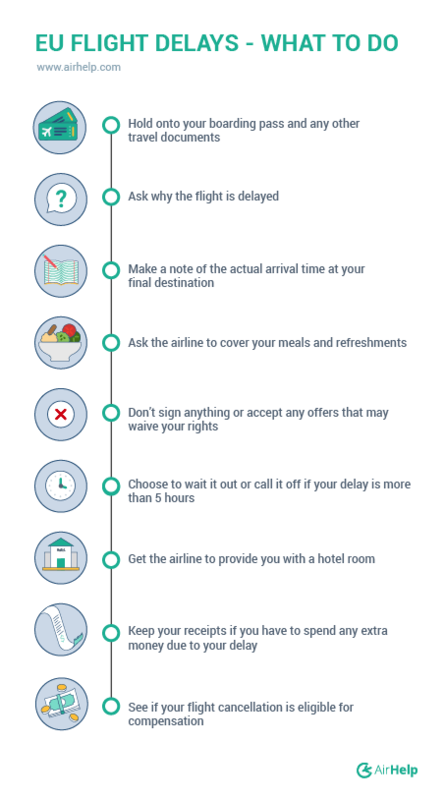 In normal circumstances, any delay at destination longer than three hours would be eligible.